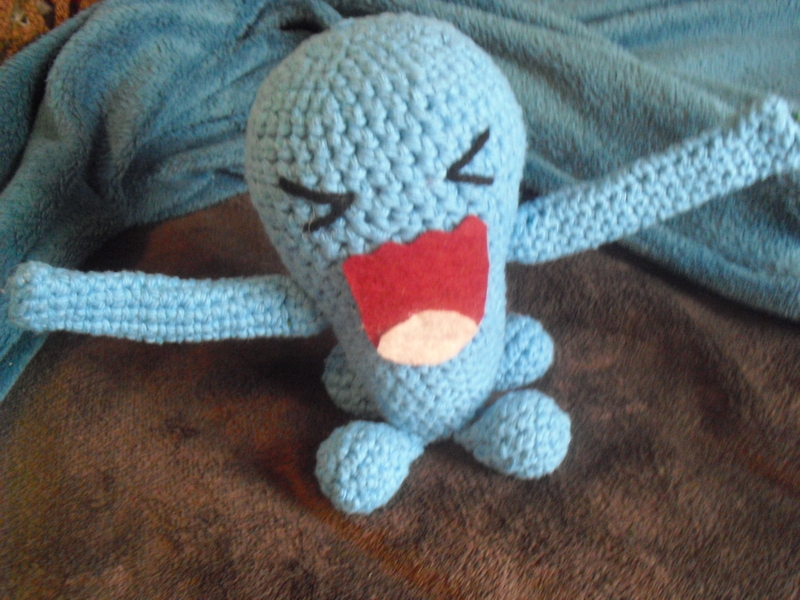 At the same time as I was working on Buizel, I started on another Pokemon that seemed pretty easy to do. 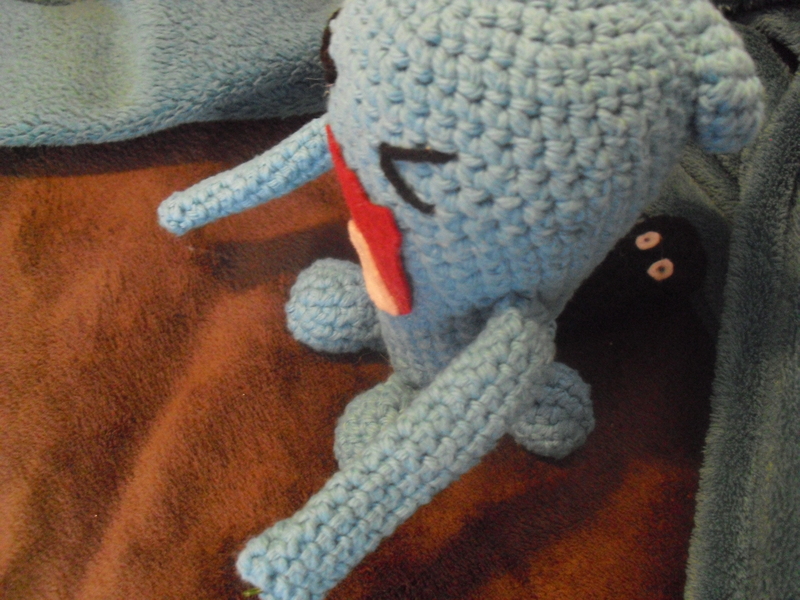 Wobbuffet is probably amongst the most odd of pokemon, but I think his oddness makes him more endearing, plus he was alot of fun to make and pose. He never really was one I thought I would make, but I have fallen in love with his Wobbish charm: his squinty eyes, huge bizarre grin, and his wide open arms. (Not to mention his beaver tail). I feel like I’m sounding crazy but you’ll know what I mean when you make him. Round 1: Chain 11, sc in 2nd chain from hook and sc in each sc across, 2 sc in last sc (11)turn work and begin to work on other side of chain. I think the hardest thing is the placement of the head flap on the back of his head. This part can be stuffed or left unstuffed, that’s up to you. It should be placed at the top, back part of the head. Look at the pictures for help. 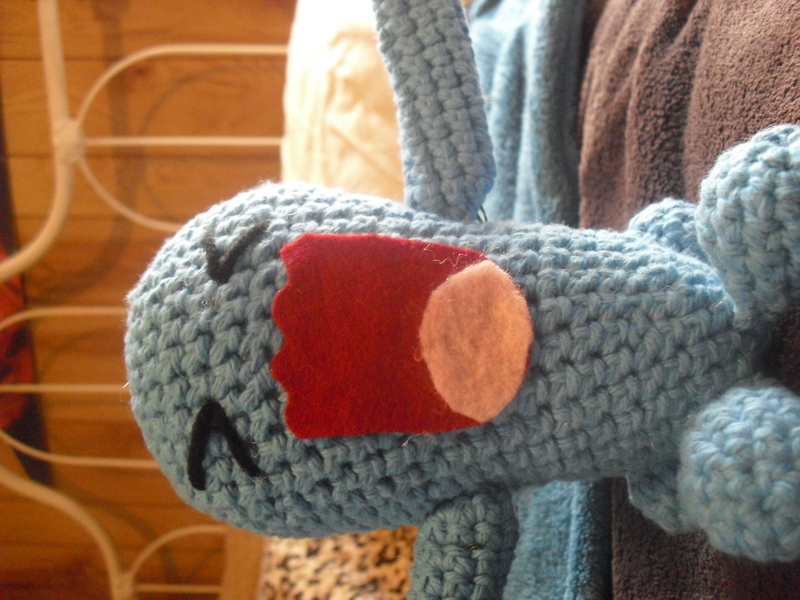 Attach the bottom nubs to the bottom of the body. They should be evenly placed around the bottom of the body. The arms should be attached half way down the body. I placed wire in the arms so they would be able to do different poses. The tail is placed above the bottom nubs but centered in the back of the bottom. Look at the pictures for help if necessary. ← The “A” in AH Creations! THANK YOU SO MUCH! 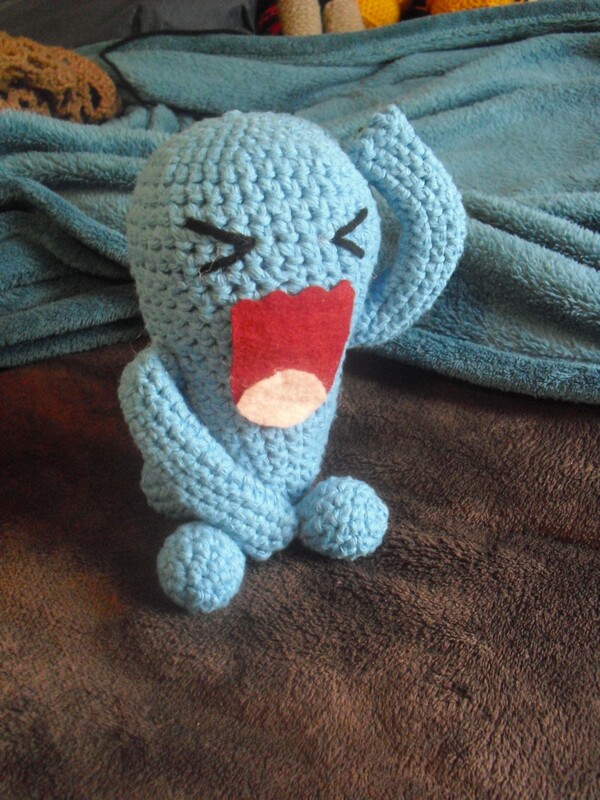 Wobbuffet is my absolute FAVORITE Pokemon, and I’m definitely going to crochet him! I was actually trying to devise my own pattern and then I found yours on Ravelry – I am so grateful! I LOVE the expression you created with felt! Great job.